When there is more than the normal number of teeth in an arcade, a common term to describe them is supernumerary. Supernumerary teeth are found in the molar and incisor arcades. Extra teeth outside of the arcades are termed as ectopic teeth. An example of an ectopic tooth would be an ear tooth, commonly called a dentigerous cyst. Extra teeth are genetic and can be found in any breed of horse. There was a supernumerary incisor found between the 201 and 202 (Fig. 1). As seen in the radiographs, the root of this tooth crossed over the 101 and 201. The extra tooth had forced the rest of the incisor teeth out of their usual positions. There was some packing of food around the tooth, however, there was no odor or periodontal disease found. The rest of the mouth was normal for a six-year-old. Supernumerary teeth (or polydontia) are teeth in excess to the normal number of teeth in the dental arcade. These teeth can resemble the normal series and appearance in the arcade. It may be impossible to tell which tooth is supernumerary. However, polyodontia can also be dimorphic or rudimentary. These types are often abnormally shaped and smaller. This is not a common finding in horses, but it occurs often enough that the oral practitioner should be on the lookout for extra teeth. During a dental exam it is best to count the number of teeth in each arcade. Supernumerary teeth can develop in a normal direction of eruption or they can develop inverted, transverse or ectopic. They can also develop singly, multiply, unilaterally or bilaterally in one or both jaws. Extra teeth outside of the arcades are termed ectopic teeth and occur rarely. An example of an ectopic tooth would be an ear tooth, commonly called a dentigerous cyst. Supernumerary teeth are found in the molar arcades as well as the incisor arcades. Wolf teeth, especially lower wolf teeth or wolf teeth in abnormal positions, are not considered supernumerary teeth. Supernumeraries are genetic and can be found in any breed of horse, but are more common in draft types. Although supernumerary canines rarely occur, they can be found. The best way to differentiate the extra tooth from the normal tooth is by radiographic examination. Should the supernumerary tooth be removed? 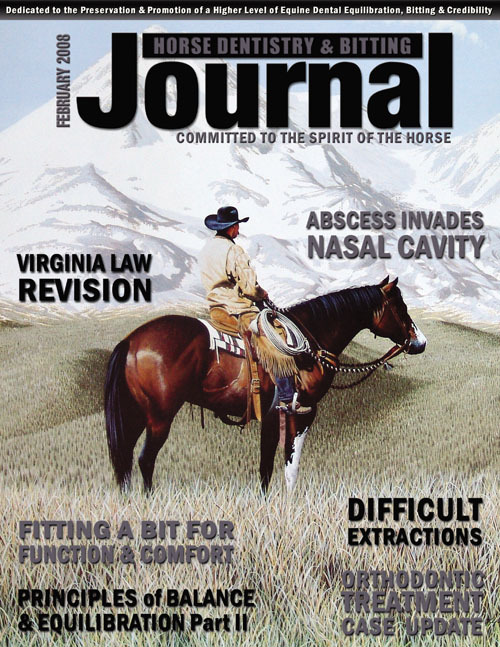 This is a 16-year-old horse and an oral extraction is possible to attain, however, extraction was not necessary. Reduction of the tooth and lower ramp produced good caudal-rostral movement. Leaving the tooth in place keeps the upper arcade “tight” and prevents the molars from drifting. Neither a diastema nor periodontal infection was present in the upper arcade upon evaluation of the oral cavity; therefore it was in the best interest of the animal not to disturb the alignment of the upper arcade by extracting the extra tooth. 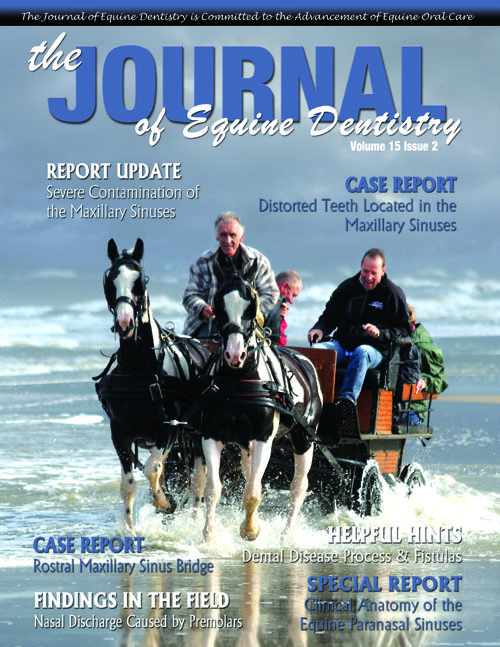 In this three-year-old female draft horse, there are three supernumeraries in the upper incisor arcade. In the oral photos of the upper incisors, we can see several deciduous teeth along with four erupted permanents and one extra tooth caudal to the 201 in the upper arcade (Figs. 1 and 2). Normally, in a three-year-old, the only permanent incisors seen are the central incisors. We can also see misalignment of the 101 and 201, which is caused from crowding of the supernumerary teeth. Feed is packing between these misaligned teeth and there is a fetid odor coming from this area, indicating periodontal infection (Fig. 2). 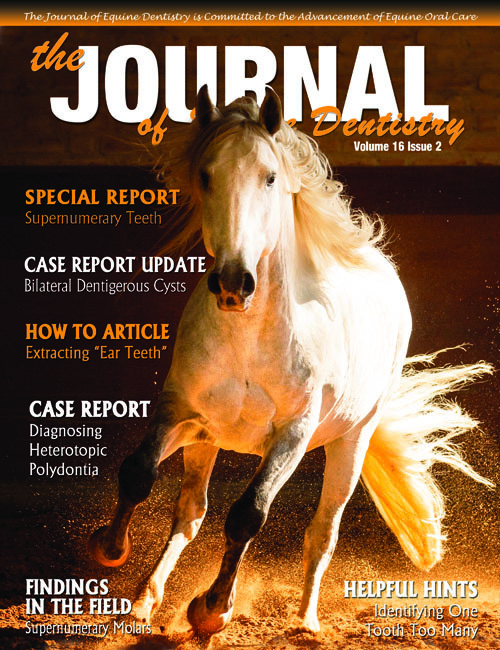 In horses, supernumerary teeth (polyodontia) can occur either in the jaw along the normal row of teeth, or in more seldom cases, at other places in the head (heterotopic polydontia) as well. The most predominant form is a fistula at the base of the ear containing supernumerary dental germs, which is frequently connected to the surface by means of a fistula-shaped canal. The tooth-like structures are mostly located at the front edge of the ear and are adherent to the temporal bone.1 However, erratic teeth are also described in the ventral nasal passage and intracranially.2-4 In horses, supernumerary teeth represent a congenital deformity due to a larger number of tooth germs, a splitting of originally single tooth germs, or a displacement or scattering of parts of the dental lamina or of the odontogenous tissue of the jaw.5 The symptoms of horses with heterotopic polydontia vary greatly, depending on the location of the dental germs; they range from painless increases in size or circumference at the base of the ear, a fistulous opening with a slimy or milky-white secretion, down to respiratory sounds, apathy, and neurologic disorders. In the case of fistulas at the base of the ear, the diagnosis can mostly be made on the basis of the preliminary report and a physical examination (palpation, analysis of the secretion, and probing the fistula). In addition, radiographs should be prepared in order to determine the existence, precise number, and location of the dental germs. Non-fistulous heterotopic polydontias are mostly discovered through a radiographic examination. However, they are difficult to differentiate from the surrounding tissue because of the superimposition of other anatomical structures in the head that are radiopaque, so that an imaging process, such as computer tomography, is the means of choice here to determine the precise location of any supernumerary teeth. A CT scan of the head of a standing horse without using general anesthesia, where the horse only has to be sedated, is only being performed in a few clinics worldwide. 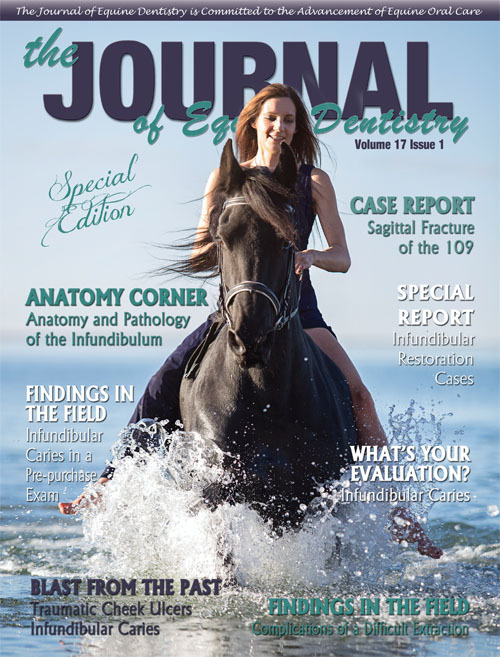 This case report of a four-year-old warmblood gelding with unclear neurologic symptoms shows the feasibility of a CT scan on a standing horse under sedation and the benefits of computer tomography. Bilateral dentigerous cysts are uncommon. A dentigerous cyst, also called an ectopic tooth, an earcyst, or odontoma, is a phenomenon that is found in equidae. It is a congenital deformation of which the cyst on the ear is the most striking symptom. In the area around the base of the ear, odontoblasts have developed to one or a conglomerate of teeth, surrounded by a sack or cyst of which the inside is covered with mucous membrane. This is a type of heterotope polyodontie. The radiographs were essential in the evaluation of this supernumerary and consequently extraction was not necessary in this case. This case demonstrates the importance of radiographic examination. 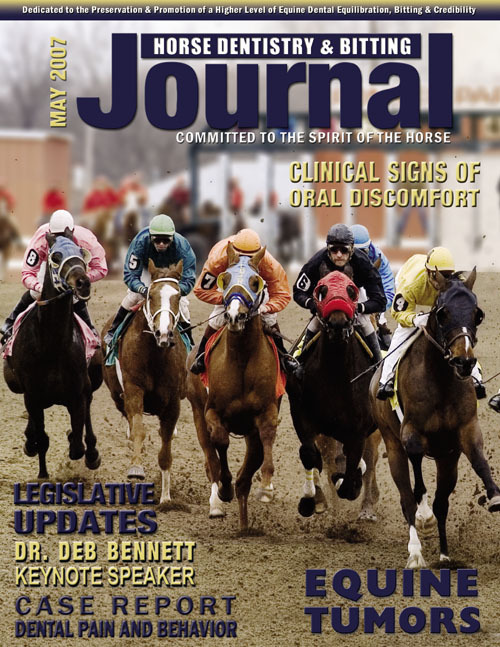 Not all supernumerary teeth are a problem for the horse. Dentigerous cysts are small pieces of tooth material that have formed where they should not be. A sac will form around the dental material that is surrounded by a mucous membrane. Dentigerous cysts, also known as temporal odontoma, heterotrophic polydontia, or ear teeth, are quite rare but do occur in young horses. The dental material is formed from birth, but may not be noticeable until the cyst becomes infected and starts to drain. They normally occur near the base of the ear with a swelling and sometimes with a draining tract. They can also be found inside the skull or nasal cavities. Since they are true cysts, all the lining must be surgically removed along with the draining tract itself to heal. Radiographs are taken to diagnose and aids in the surgical removal.